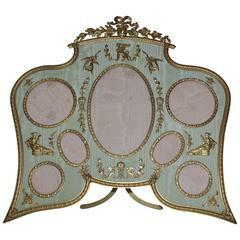 A beautiful and large French gilt bronze ormolu and green Guilloche enamel antique picture photo frame, circa 1895. Very fine quality. Marked France to the back. Frame size: 15" high x 11" wide x 8" deep with easel open Photos size: 9" x high x 7" wide Good condition, ready to place.